So I read that Justice League book and reviewed it for CBR. "Forever Doomed" is somewhat predictable with regards to the appearance of the Doom Patrol and the motions Cyborg goes through, but "Justice League" #27 is nowhere near boring. This comic book serves very well as "Doom Patrol" #0 or even "Cyborg" #0 (maybe now Vic Stone will be able to find his way to a solo series) or a companion piece to "Forever Evil," but lacks the Justice League for which this comic is branded. All the same, this is a fun, adventure-filled, character-driven study certain to please fans of Detroit's greatest hero or DC's strangest team of misfits. As a fan of both, and a resident of metro-Detroit, I found a lot to like in this comic. No, it isn't the world's greatest comic book, but it is a damn fine read filled with bombastic fun and plenty of nods and winks for longtime DC readers. Doom Patrol? Check. Cyborg? Check. Sweet Ivan Reis art? Check. Sweet Rod Reis colors? Check. Unnecessary death and destruction? Check. Looks like the DP is coming back to the DCU. Where they go from here and how they come back from this, I don't know, but I'm hoping it's good. Meanwhile, I'd love to hear your thoughts on this one, Patrollers! Okay, first of all, I couldn't help but notice that the skeleton of the gorilla has four arms; this means that whatever 'Earth-3' world on which this Crime Syndicate story is taking place includes the Byrne period DP in its history somehow. Geoff Johns is writing this and his connection to the Doom Patrol is the "One Year Later" story he wrote for the TEEN TITANS in which he bravely suggested that the various permutations of the team (even Byrne's version) were not impossible to integrate. Although he left it to Giffen to explain many of the details, it wouldn't be just wishful thinking to assume that he would still like to make that possible. For instance, the book starts with three Kupperberg characters who we saw die before the New 52: Scott Fischer (who died in "Invasion! "), Karma (in the Ostrander Suicide Squad) and Negative Woman (in Checkmate/Final Crisis). One possible clue he gives to his intentions may be that he refers to Scott Fischer as "Scorch". Scott was only around for about a year and was never given an alias. The closest he came was when letters' page regular Charles J. Sperling waged a one-man campaign to give him some kind of field code name and suggested "Blaze", which was never actually used in the stories. The dc.wikia.com page for the Doom Patrol still lists him by his real name under former members. If he's been retroactively named "Scorch", this is the first I can remember hearing of it. In fact, there's kind of a comics biz in-joke about the 'bad old 90s' in which Marvel released three concurrent mini-series which each had a different villain named Scorch. The joke was a play on their old motto about being the "House Of Ideas" and updating it to "Idea"-- singular. Or it could be that when Karma calls him "the Doom Patrol's Scorch" he's comparing him to the female villain. Karma also mentions "the trips down the tunnel of light the Chief brought us back from" after Scott says that they would be dead if not for Dr. Caulder. Caulder (then the Head) entered a tunnel of light at the end of the Pollack run in 1994 and Deadman has famously been known to loiter in the 'lobby' at the end of that tunnel. If we're supposed to believe that's Caulder on page 7, he's got a body again (as he did with Byrne, Johns and Giffen), but he's sitting down so that we don't know if he's back (or still) in a wheelchair. We are also left to guess if the brain in solution is Cliff or the Brain. The Red Room was kind of a disappointment. Instead of the sort of two-page spreads of gadgets from throughout DC history we've come to expect from Elseworlds stories, the only immediately noticeable tech is the Ace body from the Royal Flush Gang. There's a larger robot the right, mostly obscured and the red vessel the room is named for. I'm guessing that the generic look of the rest of the room is so that we don't notice the box in the lower left corner. 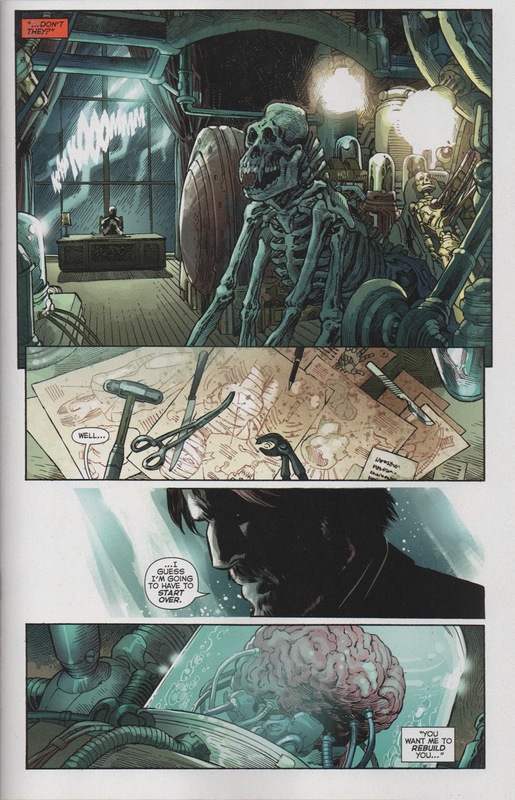 Still, it would have been fun to see something like Rick's trophy room in "Hulk: Future Imperfect" or scenes from Planetary. Having this world's Magnus be Morrow's student recalls the "52" series. The idea of him being pressed into service by a group of villains only to engineer their undoing under their noses may be tempting enough to do twice, even eight years later. I'm afraid that unless Tempest and Celsius appear in the next few issues, though, the DP appearances are just insights into what Johns would like to do in some future storyline, not foreshadowing of the conclusion to this latest interminable event. This one appearance of the NU52 Doom Patrol was enough to lure me from apathy-ville. It wasn't the worst, and not the best either. But yeah, hope springs eternal from the mind of the real Dr, Moreau, Dr. Niles Caulder. Cliff? Could be and should be, but at first with the gorilla and the brain, I was thinking Monsieur Masalah and the Brain. Probably not. But could be.